New Fed Chairwoman Janet Yellen has a great task ahead of her. How to combat the results of the Great Moderation, as it was called, that period of low inflation with moderate economic growth that prevailed from 1985 to 2007, according to Paul Krugman. But why, when lots of jobs were created, particularly the 22 million jobs created during Clinton's presidency? "...that worked in part because the political insulation of central banks also gave them more than a bit of intellectual insulation, too," said Krugman in a recent column. "If we're living in a Dark Age of macroeconomics, central banks have been its monasteries, hoarding and studying the ancient texts lost to the rest of the world. Even as the real business cycle people took over the professional journals, to the point where it became very hard to publish models in which monetary policy, let alone fiscal policy, matters, the research departments of the Fed system continued to study counter-cyclical policy in a relatively realistic way." Leaving the Federal Reserve to only worry about large cyclical swings, while allowing the markets to largely grow with little regulation or oversight worked too well, in other words. It lulled policy makers into allowing the massive deregulation of financial markets for one, which led to the Great Recession. And much worse. The result was loss of so much wealth since the Great Recession for the 99 percent that didn't profit from deregulation. The labor market in particular has suffered most from deregulation, with globalization and free trade agreements allowing even highly skilled jobs to flow overseas, while states restrict collective bargaining for government employees and unions. 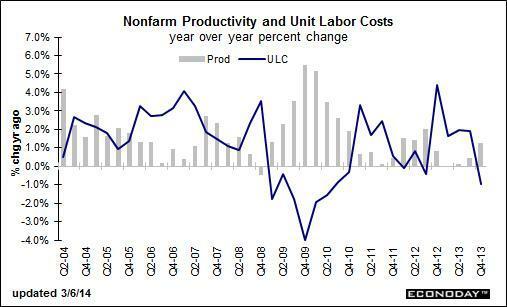 This graph of Productivity and Unit Labor Costs illustrates the damage done to household incomes. So-called unit labor costs (ULC), a measure of incomes and benefits, have not on average grown at all since 2009, the end of the Great Recession. The result is that The Great Moderation has more than moderated household incomes, reducing income growth for most Americans to zero after inflation, resulting in reduced demand and so slower economic growth that may never return to the 3.2 percent average GDP growth that prevailed since the Great Depression. "...the very success of central-bank-led stabilization, combined with financial deregulation - itself a by-product of the revival of free-market fundamentalism - set the stage for a crisis too big for the central bankers to handle. This is Minskyism: the long period of relative stability led to greater risk-taking, greater leverage, and, finally, a huge deleveraging shock... Also, sooner or later the barbarians were going to go after the monasteries too; and as the current furor over quantitative easing shows, the invading hordes have arrived." So it is Chairwoman Yellen's task to bring growth back to household incomes and the overall economy. She must ignore the maxims and experience of the Great Moderation to do it, however. She must push for more government stimulus programs--whether for infrastructure, education, or Research and Development--to accompany the Fed's efforts to hold down interest rates as long as possible to encourage moderate inflation. And she must not allow those "barbarians" at the Fed's gate who want to reduce its powers to moderate such Great Recessions.